The Virtual Disk Agent is available for purchase with UBDR Gold. This option allows administrators to generate a single Windows image backup job that also concurrently creates either a VMware ESX or GSX VMDK file, or a Microsoft VHD file during a regular Windows image backup. This is a breakthrough as no additional processing is required. Users can perform a physical-to-virtual operation in less than three minutes after a backup completes. The unique feature of subsequent differential and incremental backups automatically updating the base VMDK and/or VHD file has been expanded upon by no longer requiring performance to a UNC share path. By writing the file directly inside the datastores, a VMDK or VHD upload is not necessary if a disaster occurs. This saves businesses time and storage costs. 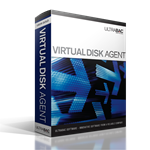 For a more comprehensive overview, please view the Virtual Disk Agent Product Sheet.